Some bearings are installed in systems where low loads and low-to-moderate speeds are expected. This type of bearing requires small quantities of oil, applied at regular intervals. In the past, this type of lubrication was predominantly performed by hand, as is still the case in some applications. However, applying lubrication by hand poses several risks such as under- or over-lubricating the bearings and missed lubrication schedules. Drip feed lubrication systems are commonly used in these applications to supply the correct amount of oil at the correct intervals. Drip feed systems, also referred to as gravity feed systems, consist of a loosely covered cup or manifold of oil placed above the bearing that meters out oil at a set interval. The supply to the bearing is controlled by a needle or conical valve, and can be adjusted as necessary. A drip feed reservoir can be connected to only one bearing, called a single point system, or connected by pipes or ducts to several bearings, which is referred to as a multiple point system. 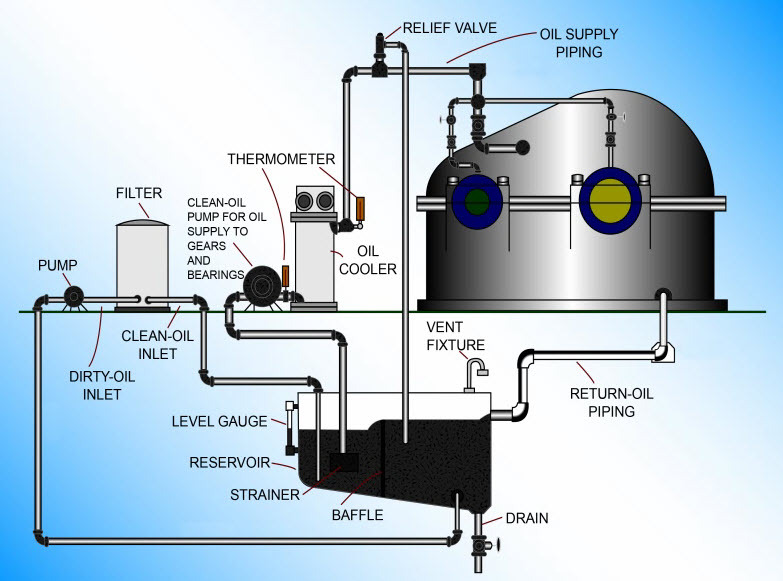 A drip feed system can also be pressurized to supply oil to a bearing system under pressure. The reservoir is partially or completely transparent, and is refilled by hand when it reaches a certain level. 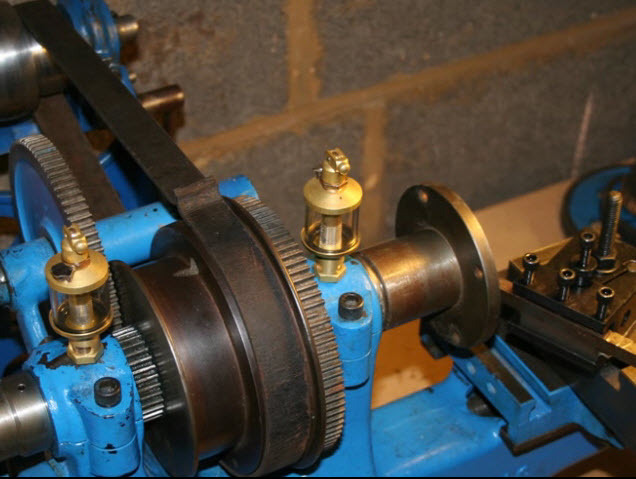 Splash feed is a term applied to a variety of intermittently lubricated bushings or journal bearings. The bearings are splattered with oil from the action of various moving parts regularly dipped in the lube oil. Splash feeding is practical when the housing can be positively oil-tight and when the rotation is not fast enough to churn up the oil. One common splash feed lubrication system is an oil ring system. In an oil ring system, a ring rests directly on the shaft. The lower half of the ring is submerged in oil in a reservoir located in the lower half of the bearing housing. As the shaft rotates, the oil ring turns, carrying oil from the reservoir up to the top of the shaft. The oil spreads across the shaft and bearings, and any excess runs back down into the reservoir. Oil troughs can also be used in this type of system to collect and direct the flung oil to specific bearings and components. Equipment operating at high speeds and heavy loads can develop high temperatures from friction. To protect the equipment from high temperatures, a high flow of oil is needed. In force fed lubrication systems, an oil pump pressurizes the oil, which is then directed to the rotating component. Examples of systems using forced lubrication are turbine generators, boiler feed pumps, compressors, and gear boxes. The graphic above shows a forced lubrication system for a gear box with bearings. The system has three continuous steps of operation. 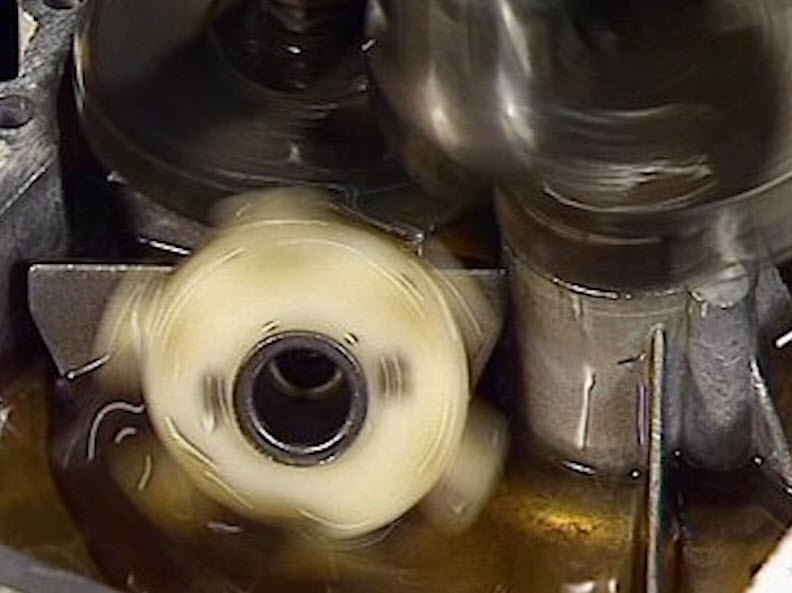 Oil from the gear box is collected and sent to the oil reservoir; the oil pump takes suction from the reservoir, and the pump discharges oil through an oil cooler and back to the gear box. Also, notice the oil filter shown in this figure. When needed, a pump takes the oil from the reservoir, cleans it in the filter, and then returns it to the reservoir. Greases are semi-solid lubricants; they are used instead of oil when the lubricant has to stay in one place or stick to a part. Greases will not leak out as easily as oils. 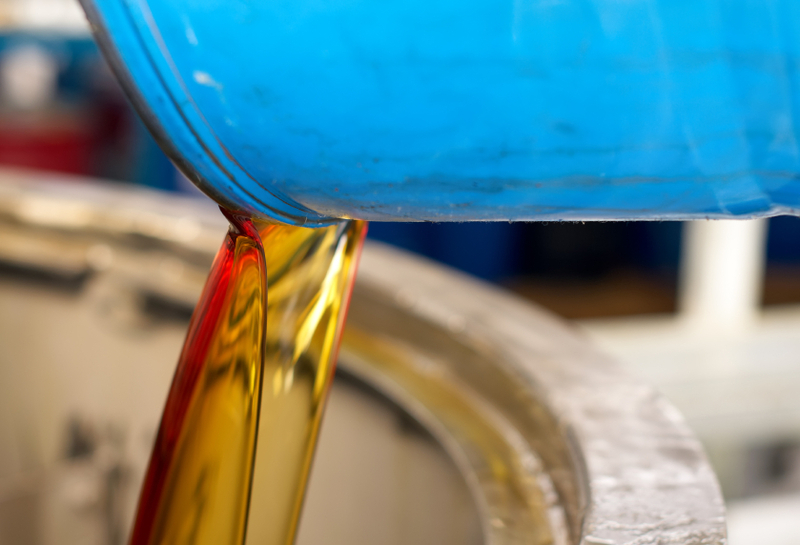 Greases are also used when the component cannot be lubricated often or are not accessible during operation. Greases are thick, or viscous, and therefore, unlike oil, cannot be pumped continuously through equipment to remove heat. 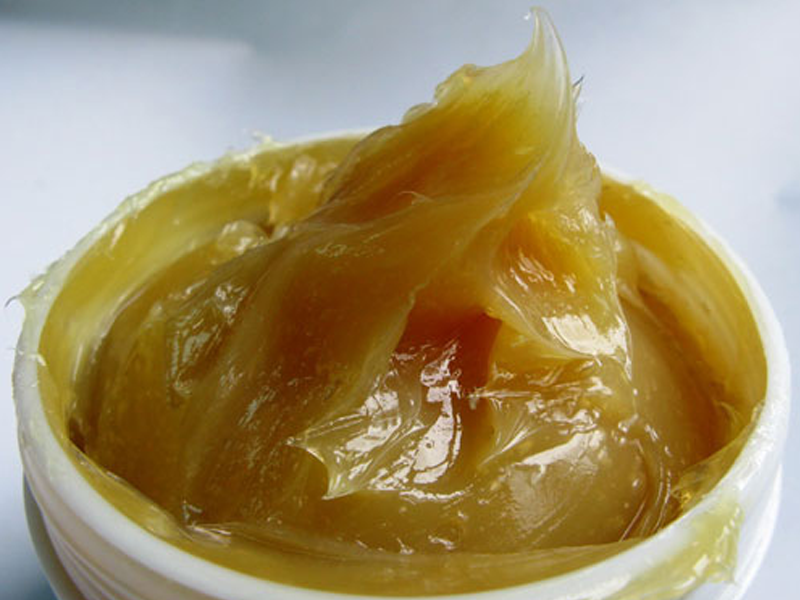 Greases are used for lubrication to prevent friction and wear, to protect against corrosion, to provide a seal from dirt and water, to provide lubrication that does not leak or drip off the surface to which it is applied, and to lubricate for a long time without breaking down. To learn more about lubrication in an easy to use and efficient way, check out our Free Module of the Month, Bearing System Lubrication, available through the new odesie® site at www.myodesie.com.